IT organizations must provide increased system performance as their workloads grow with demands for big data analysis, social media applications, continuous customer connectivity, and business-specific applications. IBM Power Systems offers ultra-reliable systems with the scalability to manage the highest peaks of transactional processing. 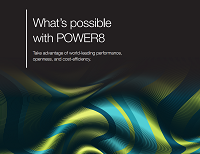 Read this paper to unlock the power of POWER8 and learn how the high-performance infrastructure can benefit your business.